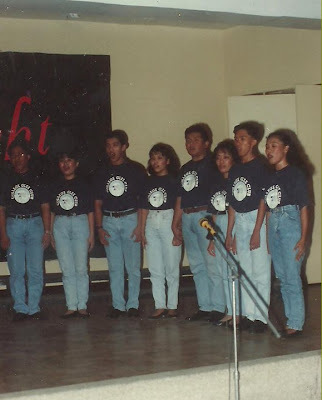 The best days of my college life was when I joined XU Glee Club. On this picture, there were six of us who graduated in College: 2 Education; 1 AB/BS, 2 Commerce and 1 Engineering. Oh I love to remember the music, the song we sang, the camaraderie of the members, the concerts and most especially our one and only conductor/mentor/arranger/pianist: Eduardo"Longlong-Lino" Abrio. He was so talented, a father figure and an excellent musician. I love those days where we have a practice after class and after work. If we could only turn back the time, I would let LongLong knew how grateful I am for having him as a mentor in Glee Club. On the other hand, I did say thank you to him many times, most of us actually. He is now in heaven and we miss him a lot! One of our rare performances in the XU Little Theatre. We all agreed that our attires were odd but, we could only laugh about it. It is funny to recall and such a nostalgic moment! I just want to share so you will know about my fun College life.